The number of cats nabbed walking* in Wodonga exploded in the last financial year. There were 256 felines impounded by Wodonga council rangers in 2016-17, compared to 159 in the previous 12 months. The 61 per cent jump has been attributed to increased trapping* of cats*. The council bought more cat traps in response to residents seeking traps*. 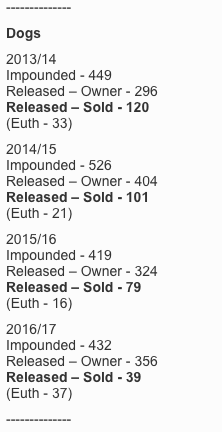 The amount of ratepayer monies hopelessly wasted on killing cats* is reflected in more cats being killed* with only 41 per cent of impounds being released in 2016-17 compared to 62 per cent in 2015-16. Only 32 cats were returned to their owner, by comparison 356 of 432 impounded dogs went home. 32 cats from 256 is about 12% reclaims. Which is horrible, but also about three times the national average (of about 4%) suggesting that a lot of this trapping is happening in residential areas and effecting owned, or semi-owned, or community owned cats. The data was contained in a 12-month review of animal pound services done by the council’s environment and community protection manager Mark Verbaken. It marked a year since the council outsourced pound services to Albury’s Canine Country Kennels and closed its outdated animal shelter. So, let's look at that report shall we? So statistics which had been going the right way - downwards year on year - has suddenly surged in the other direction. Has not having to care for pets in the pound maybe left rangers with simply too much time and not enough to keep them busy? Changing the service to an external operator has released the rangers from pet care and rehoming tasks and has permitted more time for proactive action such as patrolling areas where problems are known to exist and time to investigate dog attacks more thoroughly. Their hours of duty have also been extended by two hours a day during the week and six hours on the weekend so contact with pet owners after usual business hours is more likely to be successful. “The transition to Canine Country Kennels for the provision of pound services has proven to be sound,” Mr Verbaken concluded. He based his opinion on savings tied to not building a new pound; increased rehoming of animals; and meeting government resource sharing benchmarks. But are more pets really being rehomed? This is also in the report. Okies, well that's not overwhelming. How about for dogs? 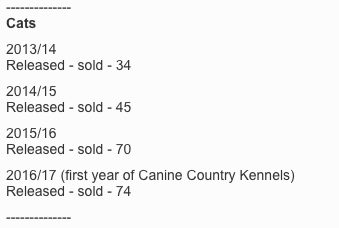 Now, to be fair their dogs stats overall are enviable. But there definitely is not, as claimed by Mr Verbaken "more pets being rehomed" now, then when council ran the pound. 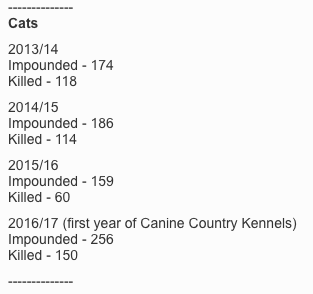 And individual dogs killed has basically doubled in a single year from 16 to 37. With the pound now servicing Wodonga, as well as Greater Hume, Towong and Indigo shires, all fees and charges were reviewed. In line with user pay principles, the new 2017-2018 budget details fees and charges that are now imposed on the pet owner, not the general community, via rates. Moving the pound program towards a user pay system rightly transfers the cost of animal impoundment from the general community to the actual pet owner utilising the service. It might feel good to 'punish the terrible owners whose pets escape', it is undeniable that increasing impound fees become a barrier to reclaims. This is especially true for cats. By the time the owner pays any fines, increasing pound fees might just mean the difference between a pet who is collected, and one whose life is left to the mercy of the pound operator. Not that they really care. "there are two recurring concerns from the public in all five councils, being the costs involved and the travel to attend the pound. A regional service, such as a regional pound, will automatically mean there are different travel distances. It is hoped that both act as an incentive for pet owners to register and suitably care for their pets." If you can't travel to collect your pet, screw you this is more efficient for us. Incentive for the win! So a new pound operator in an inconvenient location, a huge increase in cats being plucked off the streets and incinerated, a hike in costs for reclaims and a council representative who can't seem to read the numbers in his own report. Things are going swell. Removed "roaming" replaced with "walking". Removed "crackdown" replaced with "increased trapping"Removed "feral cats" replaced with "cats"
Removed "a crackdown" replaced with "traps"Removed "euthanised" replaced with "killed"
Removed "ferals" replace with "ratepayer monies hopelessly wasted on killing cats"